Want to work a seamless set-in sleeve from the top down? Did that sentence even make sense? For my Central Park Hoodie, I lengthened the armholes but wasn’t smart enough to just use a larger size’s instructions. I was then faced with this choice: destroy my brain by trying to figure out the math to make a sleeve cap and then deal with easing and sewing OR work my sleeves top-down with short rows. Guess which one I chose. 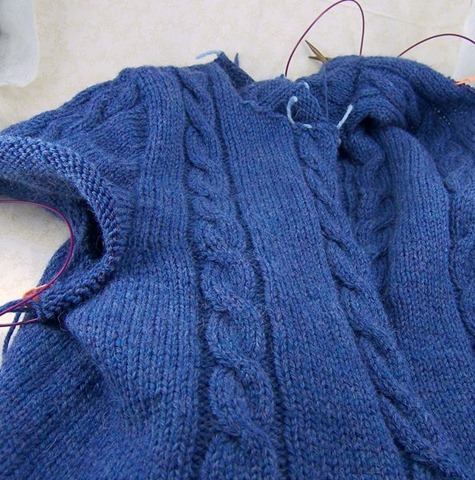 Do you know how to pick up stitches and work short rows? Then you have all the skills needed for this pattern modification. For more information on this technique, check out Barbara Walker’s Knitting from the Top or Wendy Bernard’s Custom Knits. Here are some good tutorials for picking up stitches from Knitty: Picking Up Stitches on a Straight Edge and Picking Up Stitches on a Curved Edge. 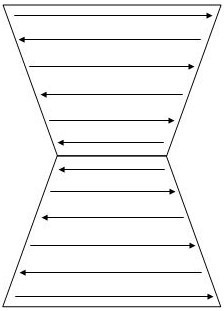 However, the short rows for a sleeve cap are just the second half of the diagram. You start with a short row and then get longer and longer, picking up wraps as you work over them instead of saving them all for the end. Now, make a decision. Do you want to work the sleeves in the round or do you want to work them flat and then seam them? Let’s assume you want to make them in the round first. Sew the shoulder and side seams for your sweater. You now have a nice armhole to pick up stitches around. Starting at the side seam under the arm, pick up and knit stitches evenly around the armhole. If you haven’t made any modifications to the armhole, then the number of stitches on the sleeve before the sleeve cap shaping starts is the number to pick up. Make sure that there are the same number of stitches on either side of the side seam. 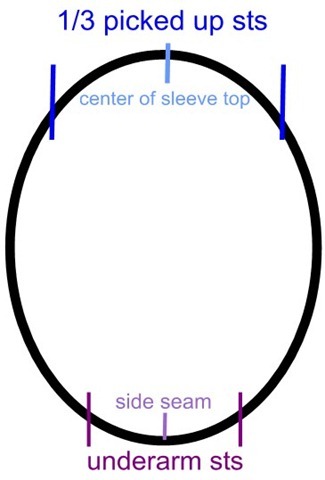 Use the shoulder seam as the center of the sleeve top. Place a marker for the beginning of the round. 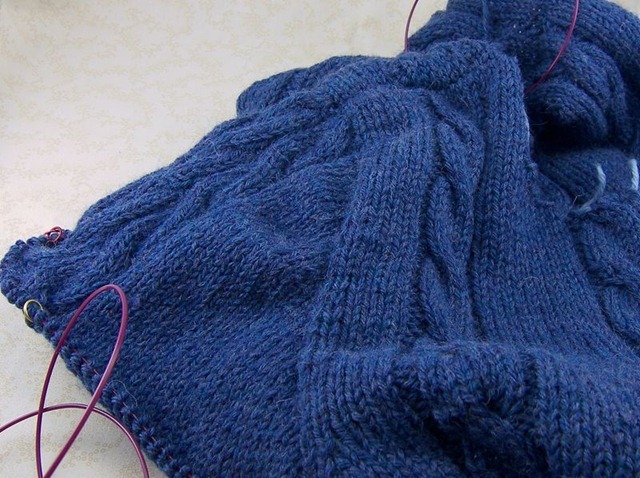 If you’ve decided to work your sleeves flat, just sew the shoulder seams of your sweater. Pick up and knit stitches evenly across the armhole. If you haven’t made any modifications to the armhole, then the number of stitches on the sleeve before the sleeve cap shaping starts is the number to pick up. Make sure that there are the same number of stitches on either side of the shoulder seam, using that as the center of the sleeve top. Now for a little math. Divide the number of stitches on your needle by 3. Go ahead and round up or down to the nearest even number. The result is the number of stitches you will need to have at the top of your sleeve cap. Center this 1/3 on the shoulder seam. Place markers on either side. Mark the underarm stitches. If you’re knitting from the bottom up, the underarm stitches are the stitches that have been picked up from the cast off stitches and decrease rows. Make sure that there are the same number of underarm stitches on either side of the beginning marker (if knitting in the round) or either end of the sleeve cap (if knitting flat). 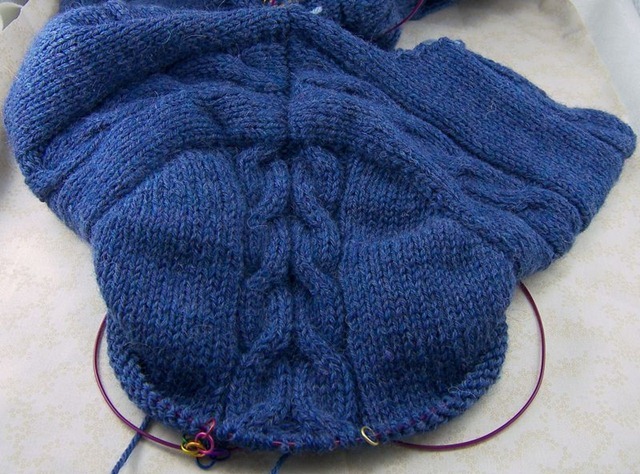 If you’re knitting from the top down, the underarm stitches begin at the first increase. Place markers at either end of the underarm stitches. If you’re knitting in the round, you should have 5 markers. If you’re knitting flat, you should have 4 markers. Okay, the set up is finished. Now, work (in pattern) to the end of the top 1/3 stitches and slip the marker. Wrap the next stitch and turn. Work back across the top 1/3 stitches, slip the marker, and wrap the next stitch. Turn and work back to the first wrapped stitch. Pick up the wrap and conceal it with your preferred method, then wrap the next stitch. Turn, work back to the next wrapped stitch. Pick up the wrap and conceal it, then wrap the next stitch. Here is an excellent write up of the various ways to conceal a wrapped stitch. Continue working back and forth this way until you reach the underarm markers, ending on a RS row. In the round, knit across the underarm stitches and continue around, concealing the last wrapped stitch as you come to it on the RS and then finishing the round. Flat, work the underarm stitches to the end of the row, then turn and work back, concealing the last wrap as you come to it and continue on to the underarm sts. Continue the sleeves as laid out by your pattern. 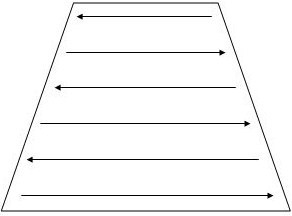 Unless the pattern has top-down sleeves, decrease whenever the pattern says to increase. Remember that if you have picked up more stitches than the pattern called for to adjust your decreases accordingly. That’s it! Not so bad, eh, and no seaming! On my CPH, I made my armhole 1” longer than called for. I knit my sleeves in the round and changed the frequency of the decreases. Starting at the side seam, I picked up 1 stitch for each cast off stitch or decreased stitch. This gave me 9 stitches for the first half of the underarm. I placed a purple marker after the 9 sts and for the beginning of the round. Then I picked up 2 stitches for every 3 rows of knitting until I reached the shoulder seam, which ended up being 35 sts. I picked up 35 stitches down the other side of the armhole, placed a purple marker, and picked up 9 stitches for the underarm. This gave me 88 stitches total for my sleeve. Dividing 88 by 3 gives me 29.33333. I rounded up to 30. 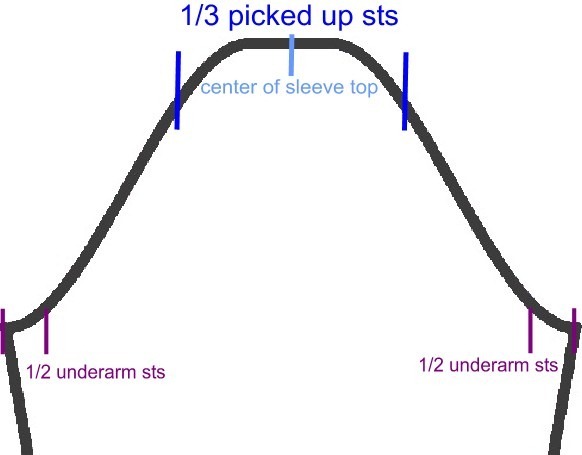 I want 15 sts on either side of the center of the sleeve top. I placed blue markers on either side of my sleeve top, which was centered at the shoulder seam. Since the CPH has cables running down the sleeve, I also placed white markers for the beginning and end of the cable chart, centered on the shoulder seam 6 sts away from the blue markers. I knit to the purple marker (the top 1/3 of my stitches,) slipped the purple marker, knit 6, then worked the sleeve cables between the white markers, knit 6, slipped the purple marker, wrapped the next stitch and turned. I purled back to the cable, worked the cable between the white markers, purled to the purple marker, wrapped the next stitch and turned. Knitted to the cable, worked the cable, knitted to the wrapped stitch, concealed the wrap, then wrapped the next stitch and turned. Purled to the cable, worked the cable, purled to the wrapped stitch, concealed the wrap, then wrapped the next stitch and turned. Once the short rows were finished, I worked the rest of the sleeve in the round. OMGosh! So glad I found this. . .I am going to try it on a couple sweaters that are currentlyawaiting sleeves! What a great explanation, and thanks! thank you so much for teaching me how to this! I’m using it a project right now. I read this entire article from start to finish and really feel that I can make my own set in sleeves now. I have come across many patterns that I like , BUT… they need sleeves! Now I can make them. Thank You so much for making these instructions clear and precise. I really like your ‘real world example’ at the end.